I have a new giveaway for you. This is for 500 Business Cards from UPrinting. Business cards are a very handy and versitle product. These are great for promoting your business, your blog, whatever you want. It's up to you! 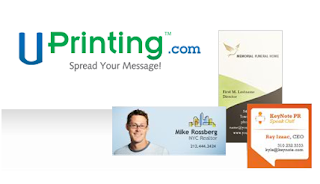 Check out UPrinting's Business Cards Online. You can upload your own image, or you can use their business card designer. They offer a lot of different options at their Print Online page. And also exciting news from my sponsor this giveaway is now with FREE UPS Ground Shipping. Mandatory Entry: Tell me how you will use your business cards if you win. RULES: Giveaway is open to US Residents only. FREE UPS Ground Shipping. Giveaway ends February 21, 2010 11:59 PM EST. Winners will be chosen via Random.org. Must have valid email in blog profile or leave email in comments otherwise you will be disqualified. Disclaimer: UPrinting.com will be awarding me 500 Business Cards too for hosting this giveaway. I would use my cards for my blog. My old ones have an old url on them. I would love to have some business cards to bring with me to Blogher this year! THIS WOULD BE SO PERFECT! I would use these business cards to help out my friend and his band. This would be really helpful for them! Thank you for the wonderful giveaway! I would use them to promote my blog. I'd make some cards for my blog! I would love to use them to promote my photography. Thanks! Daily Tweet. :) Thanks so much for the chance! I would love to have business cards to send with each purchase that I mail out from my boutiques! Thank you for the opportunity to win this give away! I would use them for Blogger cards! I'd use them as mommy cards. I would use mine to advertise the business that we just started. My best friend and I are trying to start up our own vintage clothing etsy store. We would love to use these for that! I would use the cards for my blog! Would use them to promote the blog. I would use them to promote my fledgling photography business. Thanks! I would use these to promote a new store I am going to opening. I would love to use them to promote my website. I would use them as mommy cards for my moms group. I would use them to promote my new Etsy shop opening this spring! I would use the cards to promote my local crafts booth!